For fans of Harriet Lane's HER and Paula Daly's KEEP YOUR FRIENDS CLOSE, TOO CLOSE is a twisting tale of friendship and betrayal. How close is too close? Connie doesn't have a moment to herself, no alone time with her husband, not a second to chat to her kids. 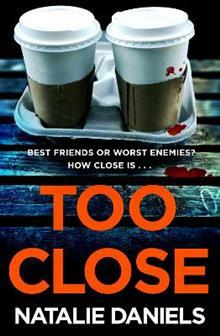 For fans of Harriet Lane's HER and Paula Daly's KEEP YOUR FRIENDS CLOSE, TOO CLOSE is a twisting tale of friendship and betrayal. How close is too close? There's a moment, when you meet someone new, when the connection is so strong that making a friend can feel like falling in love. It doesn't happen often but when it does, you know about it. That's how it was for Connie and Ness. They met in the park as their children played on the swings and they realised they were neighbours, there were only four doors between them. It was only natural that they would become entirely inseparable. But when Ness's marriage ends in a bitter divorce, she is suddenly at Connie's house all the time. Connie doesn't have a moment to herself, no alone time with her husband, not a second to chat to her kids. It's all too much. Something has to give. Connie has woken up in a psychiatric hospital. They say she committed a terrible crime but she says she can't remember a thing.